Your donation is pooled and leveraged to achieve a community benefit that would be impossible through individual contributions. An individual contribution is a beautiful thing, but the impact of that donation is so much greater when it is leveraged to secure thousands of additional dollars to support progressive social change. When you contribute to SJF, you are joining a broad community of donor organizers and activists who truly believe that we have strength in numbers. And our community is growing. We invest in activists and organizers dedicated to permanently ending inequality. We focus primarily on supporting organizations that are community based and that use community organizing to achieve their goals. Community organizing builds a base of people who share a common understanding of the problems they face, as well as a shared strategy to mobilize for change. It also develops leadership from within communities most affected by social inequities, resulting in long-term societal transformation. Unlike most foundations, we’re willing to grant organizations the resources required for day-to-day operations. We recognize that great social justice work comes with an array of indirect costs—light bills don’t pay for themselves—and we’re willing to provide our grantees with the opportunity to decide for themselves how our funds may best support their endeavors. Our grantees are led by people from the communities most impacted by injustice and inequality. By supporting efforts that are led by impacted communities, we invest in sustainable community transformation. The organizations we fund are making changes for themselves, empowering their constituents to fundamentally shift the balance of power and achieve long-term, local victories. Your contribution facilitates the opportunity for dozens of others to participate in donor activism. When you donate to our general fund, you support the infrastructure that is changing the face of philanthropy as we know it. 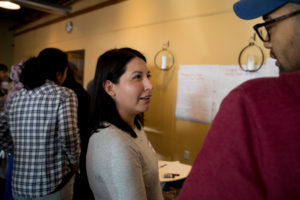 By connecting our members with the work of our grantees, we are blurring the lines that traditionally separate the two, and creating a vibrant, new culture of locally-focused social justice philanthropy. Our model educates and engages donors in ways that few foundations have been able to achieve. This truly is cutting-edge philanthropy. And you can be a part of it. Your gift is multiplied by 150. For every $1 we grant, our grantees are able to gain as much as $150 in more housing, health-care, increases in minimum wage, and other tangible resources for their communities (NCRP, 2010).